Transportation professionals who attended a showcase demonstrating innovations used on a Highways for LIFE project in California overwhelmingly rated it a valuable experience, according to a follow-up survey. Sixty-four percent said they will use or consider using the technology as a result of seeing it in action at the showcase. Using the innovation enabled the contractor to replace pavement sections quickly during nighttime and weekend lane closures, reducing the impact on motorists by 70 percent over traditional construction methods. Nearly 90 people from state highway agencies, FHWA and industry attended the event in Ontario, Calif., which showed the installation of precast concrete pavement systems to speed up rehabilitation of part of Route 15 in San Bernardino and Riverside Counties. Showcase participants listened to presentations on the value of precast concrete pavement systems in the pavement management toolkit and their use on the Route 15 project. They visited the job site at night to observe the installation of panels and a plant the next morning to watch the casting of concrete panels. Highways for LIFE sponsors showcases like the California event to give highway professionals a firsthand look at innovations that can improve safety, reduce construction congestion and enhance quality. At these events, participants learn what it takes to deploy the innovations, observe the benefits in person and exchange information with peers. "The best part was seeing the demonstration for the technology in use," one survey participant reported. "The biggest value is that when we are ready to implement these technologies, we will have people to reach out to," another said. "The quality of the work under live traffic conditions was very impressive." "Learning about the technology and potential uses was valuable." "The demonstration was very informative—outstanding, in fact." "The information provided was very informative and detailed, the presentations were well done, and the field trip was excellent." "The fact that you had manufacturers and agencies present—it was great to have that kind of personal contact with those folks." "Excellent presentations, excellent field trip. I would definitely attend something like that again." Of those who responded to the survey, 68 percent rated the overall value of the showcase on a 5-point scale as 5, extremely valuable, while 32 percent rated it as 4. Fifty-six percent said they will use precast concrete pavement systems as a result of attending the showcase, while 8 percent said they will consider it. 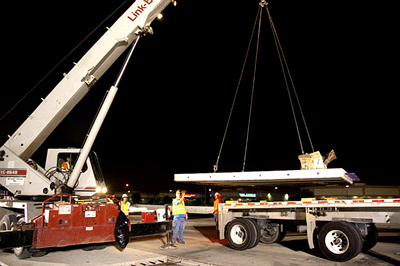 Participants in a Highways for LIFE showcase in California watched the nighttime installation of precast concrete pavement panels. "We haven't used it in our agency, but now that we see some possible applications, we are a little more comfortable with it." "I am convinced, but I am not sure I have convinced the agency to change." "It exposed us to technology that we weren't as aware of before." "Very educational, but did not really change the way we do business." "We may look at bidding installation of prefab elements in the future." "We ended up using it here in Reno for the Nevada DOT." "We already promote the technology; however, we are inspired to redouble our efforts." The Intelligent Asphalt Compaction Analyzer, a quality control tool that estimates asphalt compaction levels in real time, is almost ready for the commercial market after undergoing field evaluations through the Technology Partnerships program. The Federal Highway Administration provided a grant to Haskell Lemon Construction Co. of Oklahoma City, Okla., to develop and test the IACA technology. The Technology Partnerships program, part of the Highways for LIFE initiative, helps private industry move late-stage prototypes designed to improve highway quality or safety or reduce construction congestion to the market faster. "The scale and complexity of the problems facing the road and transportation infrastructure in our country require novel, collaborative partnerships between industry, research, and federal and state agencies," said Dr. Sesh Commuri, University of Oklahoma professor, who developed the IACA concept. "It is exciting that the Highways for LIFE program is leading the charge in this effort." "The prototype developed in this study was shown to be rugged, easily installable on any vibratory compactor, and able to estimate pavement compaction levels in real time with accuracy suitable for its use as a quality control device during the construction of asphalt pavements," concluded a Haskell Lemon report on the Technology Partnerships project. Good compaction of newly placed hot-mix asphalt helps assure roadway performance. The IACA, which is mounted on pavement rollers, analyzes the pavement response from the roller vibrations and relates those responses to an estimated compaction value of the pavement in real time. Typically, HMA is evaluated for acceptability after rolling operations are finished. If the required compaction level was not achieved, the contractor's payment could be reduced or the failed section reconstructed at the contractor's cost. Showcase participants visited a plant to see how concrete panels are made. The IACA concept uses neural network technology to analyze patterns in the roller vibrations to estimate the compaction level being achieved. The device consists of sensors and computational devices that continuously analyze the pavement responses. The IACA can take the guesswork out of paving jobs, enabling roller operators to view the information on the monitor and determine when the compaction process is sufficient. In the first phase of the Technology Partnerships project, the project team developed a commercial prototype of the IACA that could be mounted on pavement rollers and stand up to long-term use on paving jobs. The team also developed user manuals and calibration procedures for roller operators. The device was evaluated on five HMA projects in Oklahoma that featured a variety of pavement sections. The evaluation showed that the IACA could estimate pavement compaction in real time with accuracy suitable for quality control on the job and that the IACA technology calibration procedures were satisfactory for field use. The second phase of the project involved independent testing in which contractors tried IACA units at nine sites in Missouri, New York, Oklahoma and Pennsylvania. They tested the IACA during construction of full-depth HMA pavements and other typical projects. During the tests, the process of installing and calibrating the IACA device on the roller usually took less than an hour, about the same amount of time required to construct a test strip on an HMA paving job. More than 180 cores extracted at random from the completed pavements were used to verify the compaction estimated by the IACA. When the device was properly calibrated, the test results showed no statistical difference between the IACA-estimated compaction readings and the field cores. Now that the Technology Partnerships evaluation is complete, project partner Volvo Construction Equipment Co. plans to introduce the IACA as an option on new compactors in the future. "The Technology Partnerships program has been instrumental in helping validate the IACA technology and in developing a commercially viable prototype," said Commuri. "The assistance provided under this program was vital to bringing together academic researchers from Oklahoma University, asphalt contractor Haskell Lemon Construction Co., manufacturer Volvo Construction Equipment, service provider EST, Inc. and technical personnel from FHWA to help accelerate the implementation of this technology." For more information on Technology Partnerships, visit www.fhwa.dot.gov/hfl/partnerships, or contact Julie Zirlin at (202) 366-9105 or Julie.Zirlin@dot.gov. For details on the Intelligent Asphalt Compaction Analyzer, contact Sesh Commuri at (405) 325-4302 or scommuri@ou.edu. A Technology Partnerships grant helped turn the Intelligent Asphalt Compaction Analyzer into a marketable quality control tool for HMA pavements. Innovative trenchless technology will enable the Vermont Agency of Transportation to dramatically slash the cost of rehabilitating two deficient culverts under Interstate 89 while saving time and increasing safety on the project. The winning bid on the project, which received a Highways for LIFE grant for its innovation use, was $2.36 million. By contrast, the cost of open-cut trenching for the two culverts is estimated at $8 million, said Dan Landry, structures project manager for VTrans. Trenchless technology is expected to save eight to 12 weeks, compared to the traditional open-cut construction method. To open cut the two culverts would require complex detours of the interstate to circumvent the two construction sites. The trenchless project will improve highway safety by removing two structurally deficient culverts from a highly traveled section of the interstate, by making future maintenance safer and easier, and by eliminating the traffic control and hazards that come with open-cut construction. Morrill Construction Inc. of North Haverhill, N.H., plans to use a technology called pipe ramming to drive the two 60-inch (1.5-meter) -diameter bores under the interstate. One culvert, near South Burlington, will be 287 feet (87.4 meters) long with 40 feet (12.1 meters) of earth cover over it. The second culvert, near Colchester, will be 313 feet (95.4 meters) long with 42 feet (12.8 meters) of cover. Once the new culverts are installed with pipe ramming, the contractor will reline the old culverts, one with polyethylene and the other with an aluminum pipe. Pipe ramming uses pneumatic percussive blows to drive the pipe through the ground. The leading edge of the pipe is almost always open. Its shape allows a small overcut to reduce friction between the pipe and soil and to improve load conditions on the pipe. Soil is directed into the pipe interior instead of compacting it outside the pipe. This is the first time pipe ramming has been used with pipes of this length in Vermont. The interstate system in Vermont was built between 1960 and 1975. The state has 223 interstate culvert structures with a span length between 6 and 20 feet (1.8 and 6 meters). More than half, or 125, are buried beneath more than 20 feet of fill. As of 2009, 28 of those 125 were rated in poor or worse condition or could not be rated because of their location. By using trenchless methods, cost savings of about $2 million per culvert are anticipated on more heavily traveled sections of interstate. Assuming the 28 culverts now rated in poor condition will be reconstructed, overall savings from trenchless methods would be up to $56 million. The I-89 project is considered a model for other culvert construction projects. VTrans considered two other trenchless methods—pipe jacking and auger boring—for the two I-89 culverts, said Landry. Pipe jacking calls for hydraulic jacks to push pipe segments through the ground horizontally. A steerable, laser-guided tunneling shield or personnel-occupied tunnel boring machine does the digging. Although microtunneling will not be used for the I-89 project, VTrans is considering it for longer bores, said Mark Richter, construction maintenance engineer for the Federal Highway Administration's Vermont Division. Microtunneling is a form of pipe jacking that is directed and operated remotely. It usually uses a slurry mixture, run through a network of hoses and rigid lines, to remove the spoil from the cutting face of the microtunneling machine. To view the Minnesota and other technical reports on Highways for LIFE demonstration projects, go to www.fhwa.dot.gov/hfl/projects. A new tool developed under the Federal Highway Administration Transportation Pooled Fund Program helps decision-makers determine whether to use accelerated bridge construction on a replacement or rehabilitation project or go the conventional route. The software-based tool, available in fall 2011, also generates information that can be used to communicate the rationale for using a particular project approach, said Dr. Toni Doolen, associate professor at Oregon State University. She explained how the tool works during a web conference,"To Accelerate Bridge Construction or Not? A Planning-Phase Decision Tool for ABC," part of the free"Innovations" series sponsored by Highways for LIFE and the National Highway Institute. Accelerated bridge construction uses both new technology and innovative project management techniques to reduce construction congestion and save on project costs. Engineers need to assess early in the project planning process whether ABC is achievable on a particular project and whether it's the best choice. "Sometimes the choice for acceleration is obvious, but other times it's less clear," Doolen said. "This tool is designed to allow decision-makers to go through a structured process to figure out whether to use accelerated techniques." Transportation experts from eight states and FHWA worked with the research team to develop a comprehensive list of criteria relevant to the decision on when to use ABC on a project, Doolen said. It includes five high-level criteria that apply to nearly all bridge projects—direct costs, indirect costs, schedule constraints, site constraints and customer service—plus a range of subcriteria that may or may not be important in a particular case. The software program allows users to choose the criteria that apply to the project being analyzed, or even customize by adding new criteria. "Different states have different factors that come into play, so users can drop criteria that aren't relevant to a particular decision," Doolen said. The tool uses a decision-making technique known as Analytic Hierarchy Process, which is designed to select the best from a set of alternatives. This technique allows several criteria to be included in an analysis, but requires the user to compare just two at a time, using either qualitative or quantitative data. "What AHP does is simplify a complex set of decision-making processes into simpler pair-wise comparisons," said Doolen. From those, the software develops a priority ranking for the construction approaches being considered based on a weighting of the criteria. The results the software generates include graphical comparisons of alternatives that provide a picture of why one is a better choice than another. "There's also a lot of detailed information that you can share with stakeholders to help rationalize why a particular recommendation is being made," Doolen said. As part of the pooled fund study, the research team used the ABC decision tool to analyze bridge replacement projects in eight states. For a Texas project to replace the Copano Bay Bridge, which had site and schedule constraints, the tool determined that the best alternative was to use precast caps rather than conventional cast-in-place construction. For the Clear Creek Bridge project in Oregon, on which direct costs were the most critical factor, the tool found that conventional construction was the best way to go. "The tool is not predisposed to one alternative or another," said Doolen. View the Highways for LIFE playlist on the Federal Highway Administration's YouTube channel to see how the initiative is accelerating innovation to improve the American driving experience. Go to www.youtube.com. Using A+B+C contracting and other innovations on a Highways for LIFE project to replace four South Carolina bridges saved more than a year's construction time and 40 percent over the cost of traditional construction methods. "This project achieved a high level of quality and was brought to completion quickly and with relative safety as a direct result of innovative contracting and construction methods," according to a Federal Highway Administration report, South Carolina Demonstration Project: Black River Bridge Replacements on SC 377 in Williamsburg County. The South Carolina Department of Transportation rebuilt all four bridges—a main bridge and three smaller structures—at the same time to limit construction impact on travelers of the rural route. It also realigned the intersection of U.S. 521 and South Carolina Highway 377. For several years before the job was done, trucks over 5 tons had to travel a 14-mile detour to avoid the structurally deficient main bridge. The agency used A+B+C bidding to encourage the contractor to strive for the most efficient method to achieve the shortest construction time. In this type of bidding, A is the total dollar amount, B is the total number of contract days times the daily cost, and C is the number of days until the main bridge was completed times the daily cost. As a result, the project took just 14 months to complete, half the time it would have taken with traditional construction techniques, and achieved the Highways for LIFE goal of reducing the amount of time travelers feel the impact of construction by 50 percent. The contractor met the contract's no-excuse completion date and earned an incentive bonus. 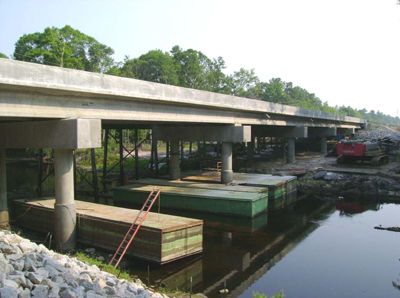 The South Carolina DOT used self-consolidating concrete in several prefabricated bridge beams on the project. It was the first time the agency had tried bridge beams made of the innovative material, which is flowable and can work its way around reinforcing steel more easily than regular concrete mixes. Before construction, the South Carolina DOT conducted a road safety audit, a tool to improve roadway design and operations. The audit team made several safety recommendations on pavement markings, traffic transitions, sight distance, side slopes and speed limits during construction. Two work zone-related crashes occurred during construction, below the preconstruction crash rate of 19 crashes a year. One crash resulted in a fatality, but it was not construction related. No worker injuries were reported during construction. The tire-pavement sound intensity values measured for the pavement surfaces showed that the new construction exceeded the Highways for LIFE goal, but the average sound intensity measured across the bridge decks was slightly higher than the target value. The smoothness measurements for the four bridges and pavement sections failed to meet the Highways for LIFE goal. The pavement sections were noticeably rougher than expected and generated a few comments on the user satisfaction survey. In general, the survey yielded user satisfaction scores of 4.4 on a 5-point scale for the new highway and bridges and 4.3 for the approach used to minimize traffic disruption, well above the Highways for LIFE goal of 2.9. An economic analysis of the project found that the South Carolina DOT's innovative approach generated a cost savings of about $6.9 million, 40 percent of the $17.1 million project cost, over conventional construction practices. Construction efficiencies from combining the projects and reduced construction time had a big impact on the cost savings. To read the South Carolina and other technical reports on Highways for LIFE demonstration projects, go to www.fhwa.dot.gov/hfl/projects. Are you reading a pass-along copy of Innovator? Do you know a colleague who would like to read about the latest in highway innovations? The new hybrid beams have just one-tenth the weight of precast concrete beams and one-third the weight of steel girders. As a result the beams can be erected quickly, which reduces construction time and traffic congestion. For one recently completed bridge in Maine, the contractor set 16 hybrid beams in one day on typical 70-foot (21.3-meter) spans. What's more, the beams could be delivered four per truck instead of one per truck. A+B+C bidding helped the South Carolina DOT finish a four-bridge replacement project in half the time needed for traditional methods. U.S. Route 60 over Jam Up Creek in Shannon County, with one 123-foot (37.4-meter) span and a 38-foot (11.5-meter) roadway. The Douglas County bridge is being fabricated and the other two are in design, said Stacy McMillan of the Safe and Sound Bridge Program. The design-build contractor for the three bridges is KTU Constructors, a joint venture of Kiewit Western Co., Traylor Brothers Inc. and United Contractors Inc. Full-scale testing was conducted to verify that the hybrid composite beams exceed code requirements, said McMillan. Laboratory testing of the beams has consistently demonstrated ultimate load capacities on the order of 10 percent to 60 percent beyond code requirements. The beams use 80 percent less cement, one of the largest contributors to the carbon footprint. They require 75 to 80 percent fewer trucks for shipping and use light-duty cranes or excavators for erection—both factors that reduce exhaust emissions. And the bridges are sustainable because there is no painting, rusting, cracking or spalling. The expected service life of the beams is 100-plus years. The Missouri DOT will use hybrid composite beams to cut construction time and traffic congestion when it rebuilds three bridges. 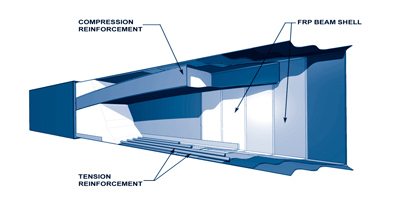 Hybrid composite beams—invented by John Hillman, founder and president of HC Bridge Co. LLC, of Wilmette, Ill.—have three main components: a fiber-reinforced plastic shell, compression reinforcement and tension reinforcement. The compression reinforcement consists of concrete pumped into an arch-profiled conduit within the beam shell. The tension reinforcement, located along the bottom of the shell, consists of galvanized ASTM A416 seven-wire prestressing strands anchored at the ends of the compression reinforcement. The hybrid beams are fabricated in a controlled shop setting. Glass fiber reinforcement and steel tension reinforcement placement is done quickly and efficiently, which increases product quality and reliability while reducing labor costs. Virginia contractor Smith-Midland Corp. has received two awards for its involvement in a Virginia Department of Transportation Highways for LIFE project that used innovative precast concrete pavement slabs to accelerate construction and enhance durability. The Virginia DOT used precast, prestressed concrete slabs to rapidly repair a two-lane ramp on Interstate 66 at U.S. 50 outside the nation's capital. To minimize traffic disruption on the busy route, the work was done at night and one lane and shoulder were replaced at a time. 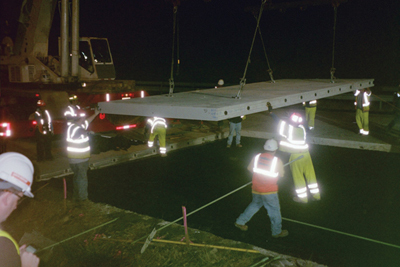 Crews install precast concrete pavement slabs at night on a rapid pavement rehabilitation project in Virginia. The Associated Builders and Contractors of Metropolitan Washington/Northern Virginia honored the Midland, Va., -based manufacturer of precast concrete products for its work supplying the concrete pavement slab panels for the project. The company also was recognized by the American Concrete Institute's National Capital Chapter for its work on the project. Cast off site and installed rapidly at the construction site when traffic volume is low, precast concrete pavement panels offer several benefits, including faster construction, reduced traffic congestion, fewer roadway closures and more durable pavements. For more information on the Virginia project, go to www.fhwa.dot.gov/innovation/innovator/issue16. 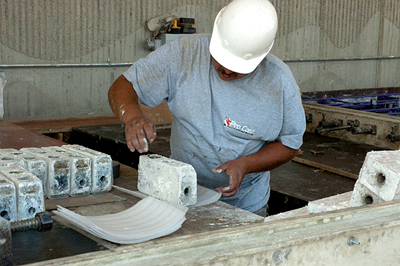 To learn more about precast concrete pavement systems, see www.fhwa.dot.gov/hfl/partnerships/bridgetech.cfm.